Lumitron offers both coated lamps and silicone booted lamps in Mil-Spec, commercial, or custom colors. Our in-house design capability can match existing colors and can conform to x-y chromaticity coordinates per the 1931 C.I.E. 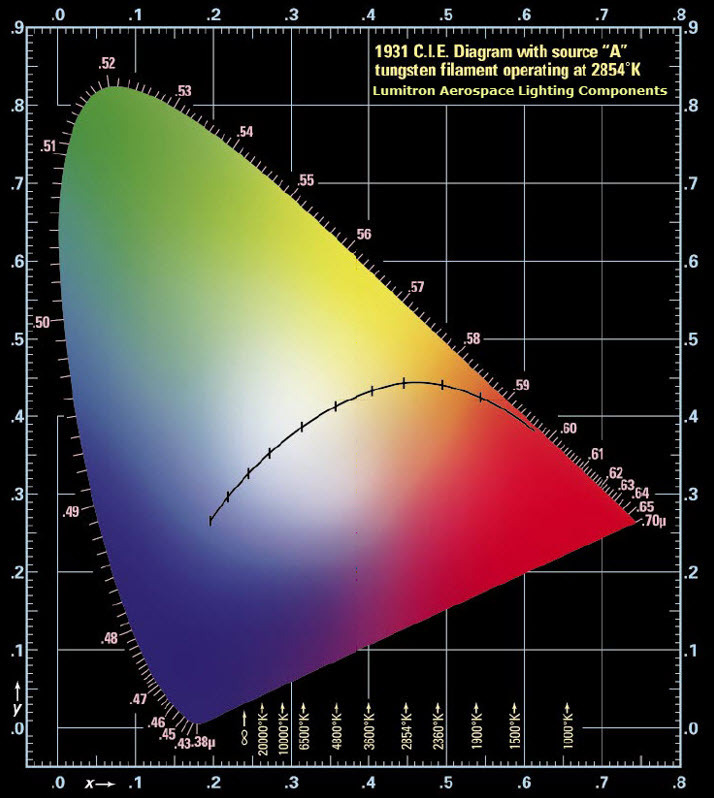 Chromaticity Diagram to meet specific design specifications. Frosted lamps are also available for diffused lighting. Color Coating: Our coated lamps have a “glass hard” polyurethane coating that allows maximum transmission of light while minimizing color shift with zero yellowing during the life of the lamp. Lumitron color-coated lamps are highly resistant to salt spray, ozone, scratches, Freon, and other solvents and can operate in a temperature range of -55° C to +85° C.
Silicone Boots: Silicone boot lamp filters are available as lamp assemblies or can be purchased separately. They are resistant to salt spray, sunlight, ozone, and most acids, and can operate in a wide temperature range. Booted lamp assemblies are potted with silicone material appropriate to the color of the silicone boot to eliminate unfiltered light leakage. Blue-White Color: Coated or booted lamps are filtered for illuminating systems for integrally white-lighted aircraft instruments as called out in MIL-L-27160. Red Color: Coated or booted lamps are filtered to conform to Aviation Red as specified in MIL-C-25050 and MIL-L-25467. The minimum color emitted is no paler or more yellow than the N.I.S.T. No. 3215 filter. For diffused red, use the color code DR after the Lumitron part number. Aviation Colors: Yellow, green, and IPL white color-coated or booted lamps are filtered to the specifications called out in SAE-AS25050. Ordering Information: Color coated lamps can be ordered by using the Lumitron part number and then adding the code letter for the color. For Example, if an MS27571-6809-AS15 is required coated per MIL-L-27160, then the Lumitron part number (L-6809-AS15) plus the code letter (B) would be part number (P/N) L-6809-AS15-B. For silicone booted lamp assemblies add –SB after the color code. For example, L-715-AS15-R-SB is an MS24367-715-AS15 lamp with a red boot. Please let us know if you would like to order boots separately.